When I started to upload the images for this post, I realised this past week has been quite productive. It never feels that way, as time for creation is limited, but in the end, if you take the time to look back, it does add up! I'm quite pleased. First photo is of a brown 'helmet' hat in Merino wool. 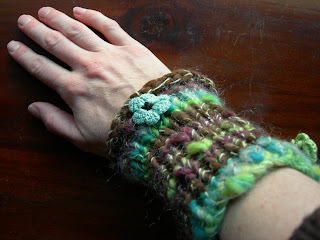 A bit funky, but very warm and cozy. It's tricky not to have the white dots move on me at the different stages of wetting, but they turned out ok. 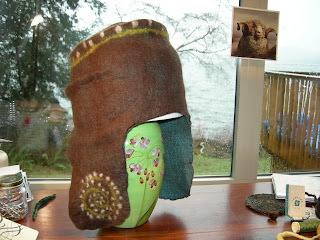 This is a picture of one of the first stages for felting the helmet. 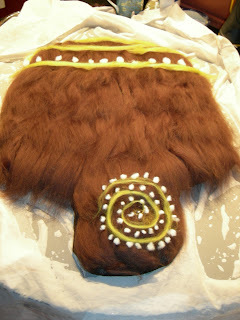 Laying out the layers of felt around a resist shape and adding the design. 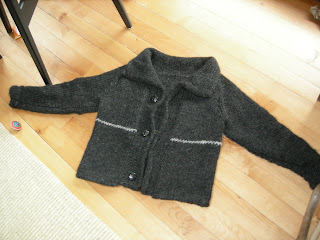 And last, but not least, I wanted to show you my Lopi cardigan that I finally finished... It has taken me one full year... Well, ok, I started on Christmas day, knitted quite consistently for a while, then dropped the project and only took it back up last week to finish. Such a relief...! You have been productive! I love the hat, it is so cool. 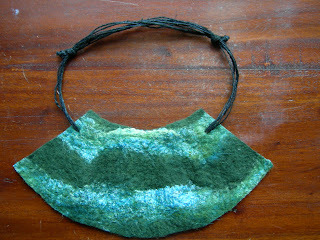 The necklace that you made for me is truly beautiful. I am very impressed by your sweater... I have never been brave enough to make a garment for an adult! Thanks for all the compliments Anna! I know what you mean about knitting adult garments. But this sweater knitted up fairly quickly, even though it took me a long time to finish. Big needles (Size 10) and super bulky Lopi wool made it fairly fast. I adapted a pattern from Rowans magazine for this sweater.